" I was new to the area and didn't know anyone. We decided to try out Kindermusik on the recommendation of our neighbour. What a great decision both my daughter and I have made new friends. It's such a lovely community of people"
Wiggle & Grow encourages toddlers to uncover an engaging musical world while building confidence, self-control, and communications skills. Singing, imitating sounds, rhyming, and object identification foster language skills, while creative movement to various musical “moods” develops a sense of balance, timing, and spatial awareness. Listening and turn-taking encourage blossoming social skills. 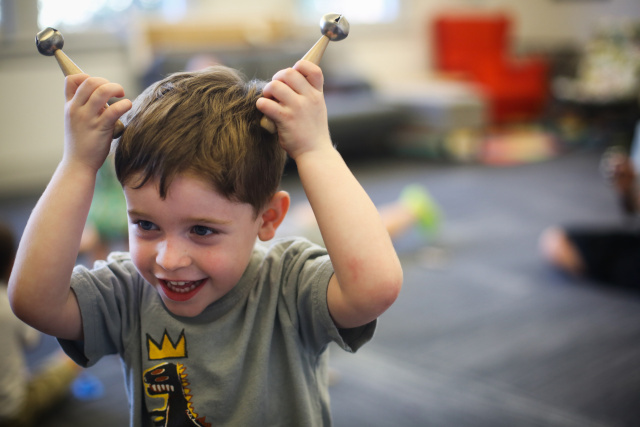 Wiggle & Grow reflects the emotional foundations of school readiness and the latest research on music and early childhood development. Wiggle & Grow is a unique opportunity for parent and child to interact and learn together in an unhurried and joyful manner. For the toddler, every day brings new discoveries and opportunities to explore the world. Despite a display of independence, the 1.5 to 3 year old child still longs for the safety and security of parental closeness. During this time, toddlers still relishes the comfort of the familiar while also seeking the challenge of something new. Instrument exploration and ensemble skill development. Children will explore the physical characteristics and sounds of age-appropriate instruments which will eventually lead them to discover their potential for beat, rhythm, melody, and ensemble playing. Vocal play Through vocal play, toddlers learn to form vowels and consonants, say words and phrases, and imitate rhythm and vocal inflection. In Kindermusik Wiggle & Grow, vocal play is presented within the context of songs, chants, and activities done in class. Exploration Time Children will love discovering specially designed instruments, textures, sounds, and movements. Movement Activities Each class provides various opportunities for movement such as synchronized movement, group dances and circle games, and even expressive movement. Together Time Kindermusik is the essence of quality time, allowing parents to make the most of the fleeting toddler years, giving them the time and the tools to make music and memories together in class and at home. Expert advice A Kindermusik educator explains how the musically based activities enhance a toddler’s complete development. Digital@ Home materials with downloadable music, activities, games, videos and parenting tips. Away We Go!-- Hop on the train, get in the car, board the plane, and Away We Go! This class focuses on transportation, a favorite topic for toddlers who are on the go, go, go! Sing and play along with favorite songs, such as “I’ve Been Workin’ on the Railroad” and “Wheels on the Bus”. Explore fast and slow, smooth and bumpy, and high and low. Read stories about ways to get around. Shiny Dinah tells the story of a train, and Giddy-Up! has a horse, speedboat, racecar, and more to help you get where you want to go. Home Materials: Double CD featuring songs from class; two interactive story books—Shiny Dinah and Giddy-Up! to develop early literacy skills; Home Activity Book, and two harmonicas designed for toddlers.